Publisher: Konami. Developer: Double Helix. Released: September 2008 (US); February 2009 (Europe). Dense fog. A cheap torch that leaves you straining to see through a suffocating blanket of darkness. The freakish monsters, and the static-spitting radios that warn of their presence. The harrowing Otherworld… It’s fair to say that few series are as distinctive and striking as Silent Hill, meaning it has remained an alluring fixture as a survival-horror venture that’s as unique thematically as it is destructive on the nerves. But as pleasurable (perhaps that’s the wrong word) as each return trip to the cursed backwater town has been, the series has been in decline; unsure of how best to channel its potential, and sadly Homecoming is symptomatic of such troubles. Most of Homecoming actually takes place in the town of Shepherd’s Glen, where you control the token troubled-hero Alex Shepherd, on a search for his missing kid brother Josh. 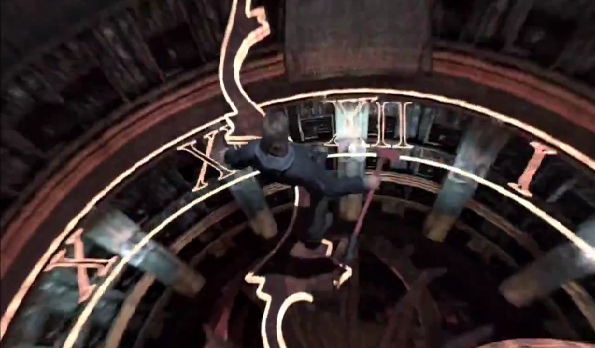 Double Helix, the third different development house in as many Silent Hill’s, opted for a fixed, third-person perspective that remains behind Alex for the duration of the game. It doesn’t quite kill the atmosphere, but it’s fair to say the absence of the awkward, voyeuristic camera angles of old reduces set-piece scare potential considerably, as well as the general feeling of vulnerability. It means you no longer fear what might lie in wait because you can always see in front of Alex. The purpose of the view change is to aid the new battle system, which for periods of the game is, for better or worse, the focus of attention. For some reason, Alex opts to carry a piteous amount of spare ammunition for his guns and instead lugs around knives, pipes and axes, meaning lots of melee action awaits. Locking-on to targets allows you to perform horizontal and vertical strikes as well as a dodge manoeuvre, the mastery of which is imperative to the preservation of your health. Perversely, the opening few hours of Homecoming are significantly more challenging than the last few. The monsters are excellent, almost all requiring specific tactics to beat; the Smog creatures for instance have damaging, smoky breath, but can be shot down when they expose their lungs, whilst the spindly Needler’s sport razor-sharp bladed arms, but are susceptible to side attacks. The Feral (dogs) and knife-wielding nurses are dangerously unpredictable, capable of inflicting large amounts of damage in no time at all with their aggressive tactics; however walking slowly with your flashlight turned off is a good way of avoiding conflicts with the latter. These clever foes can soak up a good few hits, making the early phases of the game punishing and rather too combat-orientated, with very few health drinks available. Fortunately, the difficulty relents after a while, and there are some good sections. Most notable amongst them is the Prison, one of the few locales where Homecoming manages to gauge the mixture between exploration, combat and problem-solving really well. The customary trip to a strange church is abruptly followed by the blatantly-Hostel inspired Underground Lair, making for a chilling though stylistically-questionable final area. It’s particularly disappointing to see Double Helix have included the mining suit/gas-mask wearing figures from the film, incongruous as they are to the mythos of Silent Hill and highlighting a lack of imagination when trying to develop the canon. The game’s decent and varied monsters are put on the back-burner in the latter part of the game as for the first time the series resorts to making you fight humans; a task made unintentionally easy by the lumbering cretins’ inability to dodge melee attacks, meaning they’re a minimal threat. Homecoming is at least moderately atmospheric (though short on scares), even if it sticks to a path well-trodden, and the boss fights are an appreciable challenge. There’s still some satisfaction to be had the familiar routine of finding keys, decoding puzzles and ticking off rooms on your map, but clumsy design harms things. Alex is the first Silent Hill character without the ability to run, as you’re never given the option to break out of a jog even when chased by quicker enemies and depending on the depth of a room/corridor, the flashlight effect is poor to the point of useless. The inventory system could have done with being more economical, as it’s unnecessarily fragmented; items and weapons are selected with different shoulder buttons, which is fair enough, but then to view your objectives (mostly useless as they tend to fail to update after you finish a task) you must go through the map screen, whilst Alex’s Journal of clues and notes is found via the pause menu. A bit of a palaver, all in all. In fairness, the story could have been a lot worse, but you get the feeling that a lack of subtly and invention means certain themes make an appearance without any genuine reason; it’s like Double Helix have attempted to pay homage to the classic Team Silent games without really knowing what really made the early Silent Hill’s tick. Having Alex fall unconscious only to awaken elsewhere could have been taken as artistic licence had it happened once, but it becomes such a recurrent feature that in the end it seems like a crude, insipid way of shepherding (pardon the pun) Alex between unrelated locations; for instance the atrium of a hotel and a holding cell of a police station. The Pyramid Head monster (or ‘Bogeyman’) makes two fleeting appearances that are literally nothing more than fan-service cameos that, just as in the film, neither makes any reasonable link to the main narrative or acknowledges the symbolic significance of the creature. The fog is as claustrophobic as ever and the stylisation is still very much Silent Hill, but it’s not as attractive as it ought to have been, with some graphical discrepancies that, given the hardware, shouldn’t be there. Cut-scenes are beset by horrible lighting quirks that see shadows flicker and wobble across characters’ faces in an awkward ugly fashion, whilst blocky texturing spoils some of the facial features. Unlike in the previous games, you can pass through many doors and rooms without loading breaks which is good, though the trade-off in some of the larger locations – particularly the cemetery – is a noticeable reduction in the frame-rate, which also affects combat now and then, meaning shooting becomes frustratingly hit and miss. The trademark graining effect has also been overcooked, meaning certain areas are tainted by undesirable blotching around the edges. The standard, fog-ridden streets are very good, though the once-gruesome Otherworld locations are too short and don’t appear dingy, grimy or dark enough to achieve their full scaring potential. But whilst the visuals aren’t up to the series usual skyscraper standards, other aspects of the package remain impressive. The major plus point as ever is the fine soundtrack by series-mainstay Akira Yamaoka, as his haunting refrains remain affecting, even if they aren’t as memorable as his earlier works. The voice-acting has also come along, with more or less every character of note being dubbed in a degree of competence, lending credence to the sombre mood. It’s a short adventure, with tough puzzles likely to occupy more of your time than combat or exploration. And for once, the myriad of endings don’t act as a significant incentive; the majority are very brief and not worth the hassle of unlocking, whilst the absence of a trophy patch doesn’t help matters either. More troubling still, it’s the first instance of a Silent Hill where the idea of even a second playthrough really didn’t grab me. Whilst new monsters and settings will tempt the more dedicated of fans back for a just-about-adequate slice of survival-horror action, Homecoming is the least impressive Silent Hill game yet and some way short of the series’ terrifying best. There’s the odd positive here and there, but on the whole, the scares feel limp and the once-striking thematics seem half-hearted, leaving the series in need of some fresh impetus and perhaps a return to its Japanese roots.